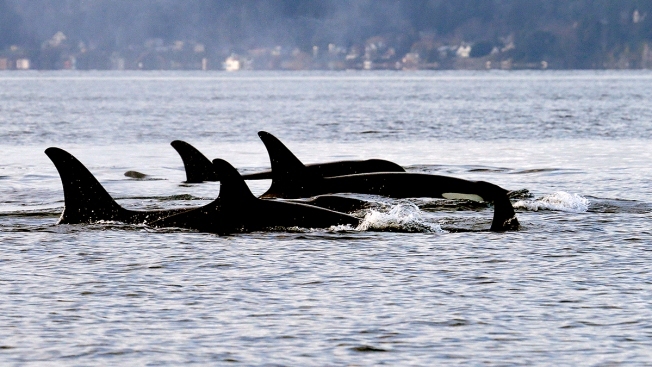 In this Jan. 18, 2014, file photo, orcas swim in Puget Sound, west of Seattle. Two more Puget Sound orcas are ailing and probably will be dead by summer, according to an expert on the critically endangered population of killer whales that live in the waters of the Pacific Northwest. Drone photography taken this past September showed the ailing population of orcas known as the southern residents went into the winter thinner than they were when the whales arrived in the San Juan Islands last summer. They also are thinner than Puget Sound's so-called northern resident population of killer whales, which have been steadily growing in population for the past 40 years in their home waters primarily in northern British Columbia and southeast Alaska, where they have access to more fish and cleaner and quieter water. The northern residents gave birth to 10 new calves last year. The Seattle Times reports Center for Whale Research founding director Ken Balcomb said photos taken of a southern resident orca known as J17 on New Year's Eve showed the 42-year-old female has so-called peanut head — a misshapen head and neck caused by starvation. In addition, a 27-year-old male known as K25 is failing, also from lack of sufficient food. He lost his mother, K13, in 2017 and is not successfully foraging on his own. Several southern resident whales were documented to be pregnant in September, but so far there has been no sign of babies. The southern residents have not had a successful pregnancy in three years. The southern resident population is at a 35-year low after three deaths in 2018. There are only 74 left. Losing J17 would be a blow to the southern residents because she is a female still of reproducing age, said Deborah Giles, a research scientist for University of Washington Center for Conservation Biology. Giles said she was not surprised to hear about K25. The social dynamics of the southern residents, in which older females help their pod, and especially their sons by sharing food, is both a blessing and a curse if that female dies, Giles said. "These large, adult, hungry males benefit by the females in their family," Giles said. "There probably is still family foraging going on, but not like he had when his mom was alive." The coming year is not looking any easier for the southern residents in terms of their food supply. The whales mostly eat chinook salmon. Ocean conditions and poor river migration, with warm water and low flows, have hurt chinook salmon returns in the past several years.